Combine Lanyard Colors To Get Price Break! Note: >The standard pricing comes with -BC plastic badge clips. If you choose -PK, -PO, -ST, -O or -CP attachments then an extra $0.25 / each will be added automatically. Special Offer Now!>Different color of lanyards and different sytle of hardware attachments will be added up to get the total quantity price break! 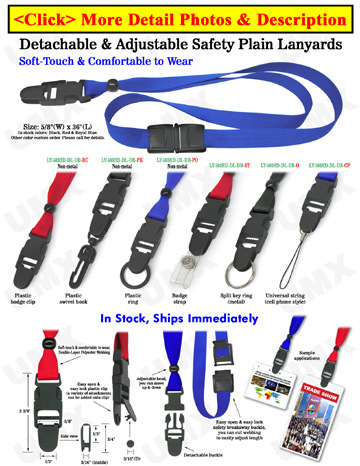 The comfort to wear safety lanyards come with most of the hardware attachments, safety breakaway, detachable buckles and adjustable beads in one lanyards. The all-in-one safety lanyards are one of the x-ray-free models too. No matter it is at labs., airports, schools or any secured access systems, these safety breakaway, detachable and adjustable plain lanyards are great for your security needs.